Sat., Aug. 24, 2013, 9:15 a.m. 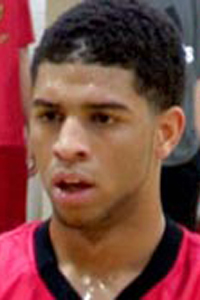 Surrounded by friends and family in a television studio in his hometown of Denver, Josh Perkins on Saturday morning announced that he will play college basketball for the Gonzaga Bulldogs. Perkins, a 6-foot-3 foot point guard, is ranked No. 24 in ESPN’s top 100 players in the 2014 class. He’s also ranked in the top 30 by scout.com and rivals.com. Few has been a regular in the crowd at Perkins’ games. Perkins, who selected Gonzaga over UCLA and Minnesota, is one of the highest rated recruits in program history. Numerous Zags have been ranked in the top 100 nationally, including current guard Gary Bell Jr., who was rated 68th by ESPN. Jeremy Pargo was listed as high as No. 21 and Austin Daye checked in at 32nd. Matt Bouldin, a Denver-area product, was 45th. Perkins averaged 25.2 points and 6.5 assists at Regis Jesuit High last season. He is regarded as an excellent passer and a capable scorer with 3-point range. Perkins’ AAU season was slowed by a shoulder injury in July, but his play over the last few years brought numerous scholarship offers, including Kansas, Arizona, Georgetown, San Diego State, Florida State and Kansas State. “Josh has a unique gift of making the perfect pass and he makes the other four guys on the court better,” Huntington Prep coach Rob Fulford told fansided.com. “The game has changed so much over the last 10 years (and) not all point guards do that now. Josh can score and he picks his spots when needed. Perkins joins Silas Melson, a 6-2 guard from Portland’s Jefferson High, in the Bulldogs’ 2014 class. Forward Kyle Wiltjer, a Portland native who played two years at Kentucky before transferring to Gonzaga earlier this summer, will become eligible in 2014 after sitting out this season. Perkins’ father, Randy, was asked about his son’s decision. Published: Aug. 24, 2013, 9:15 a.m.